On the Maldives, she said that ties with the island nation were ânot broken and cannot be broken"
NEW DELHI: Minister of external affairs Sushma Swaraj on Monday addressed several key foreign policy issues as she addressed a press conference to mark her government's fourth anniversary. Addressing the annual press conference, the minister spoke on issues ran ging from country's ties with Pakistan to concerns related to H1-B visa. The message from the external affairs minister was loud and clear - Terror and talks cannot go together. "We are always ready for talks with Pakistan but with a caveat that terror and talks cannot go together. This is our position and there is no change in it," she said. However, the minister asserted that engagements such as track-two diplomacy and NSA-level meetings will keep taking place. "We had separated NSA talks from comprehensive bilateral talks as we said terror and talks cannot go together but talks on terror should be held. Under the NSA-level mechanism, there are discussions on terror," she said. She also slammed the Congress's criticism of Centre's "flip-flop" policy on Pakistan. "It was because of our consistent policy, Pakistan has been isolated and the international community has bee n putting pressure on Pakistan to take action against terrorism. Because of this pressure, they are now wanting to talk to us," she said. The minister also hit out at Pakistan over its "Gilgit Baltistan Order 2018" relating to administrative control over Gilgit-Baltistan, saying Pakistan always "distorts history". "Pakistan tries to teach us history and geography. It is one country which does not believe in rule of law and I would just say one thing to their answer 'look who's talking', Swaraj asserted. India is talking with the US on the issue of H1-B and H4 visas, the minister said. "The H4 visas were issued at India's request from 2015 when Barack Obama was the US President." "We are trying to save the H1-B and H4 visas t hrough talks with the White House, the State Department and the US Congress. We have made our request but the US is a sovereign country. I don't know what the future holds," she added. India is not mediating between the US and North Korea for talks between those two countries, Swaraj said. Answering a question, Swaraj said that ongoing negotiations with North Korea started with a summit-level meeting between North Korea and South Korea. "After that, there was the talk of a meeting with the US. Then the US felt that China can play some role in this. Nobody has asked us to play any role and nor are we playing a role here," she said. The minister made it clear that India does not recognise country-specific sanctions. "Our foreign policy is not made under pressure from other countries," she said at a press conference here. 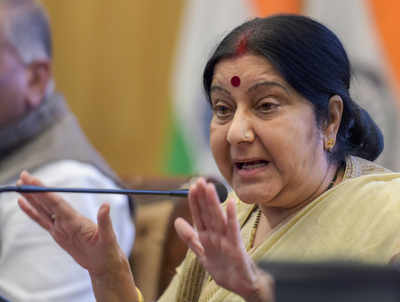 Stating that she will h old talks with Iranian Foreign Minister Javad Zarif who is in India now, Swaraj said: "We recognise UN sanctions and not country-specific sanctions." US President Donald Trump, earlier this month, announced his country's withdrawal from the nuclear deal. India and Iran have friendly relations and significant trade ties in many areas, particularly in crude oil imports into India and diesel exports to Iran. The minister said though bilateral ties may have seen ups and downs, they were "not broken and cannot be broken". Swaraj said India plays the role of a counsellor and gives humanitarian assistance to the island nation. "Maldives is our neighbour.â India First' is part of their foreign policy. In ties with the Maldives, whichever government has been in power (in India), there have been ups and downs," Swaraj said. Swaraj's remarks come days after Navy Chief Admiral Sunil Lanba said the Maldives is a "challenge" for India at the moment as its current government is more inclined towards China. Responding to the Congress' allegations that she just takes care of the Twitter handle, Swaraj said: "Ministry of External Affairs during Congress rule was an elitist ministry, it had nothing to do with the common people. My Twitter is doing the job of connecting MEA with commoners." She said it was possible to transform the ministry as she is in politics for 41 years, fought 11 elections and is from Lok Sabha and thus knows the problems of the people. As a minister, it is her first priority to solve the problems of the people, she said. "We have added the people's policy in the foreign policy. The insensitive people may laugh at it, but as k the entire nation and those Indians stuck in a foreign land. They (Congress) will understand when one of their own gets stuck one day," she said. As for the allegation that the MEA has shifted to Prime Minister's Office, Swaraj asked: "How am I answering all your questions if I do not know about the foreign policy as I only look after the Twitter handle?" On Doklam, she said the entire international community appreciated India's handling of the issue with diplomacy and dialogue, which otherwise they thought the standoff was not possible to resolve without a war. "Doklam has become their obsession. There is no change in the status quo on Doklam. People did not think the standoff would be solved without a war but the entire international community appreciates India for successfully solving the issue with diplomacy and dialogue," she said. The minister also ruled out charges of distancing Russia. < br/>"Just look at the visuals of Sochi informal summit. There is no distancing of relations with Russia. Russian President Putin invited PM Modi for the informal summit and despite lack of time Modi went in the morning and came back in evening. If somebody says we have distanced Russia it is completely untrue," she said. 10 cool th ings you didn't know the phone would do.